Although the group of seven stayed limited to that number, there were about four other artists who moved in and out of the group while maintaining a steady membership at seven. 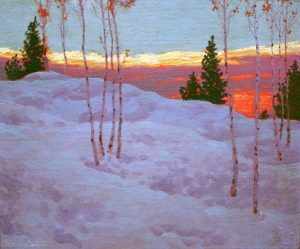 One of those who associated with the group for a short time was Canadian landscape artist Frank H. Johnston. By now you have noticed some similarities in style and technique and even subject matter chosen by those within this group. Those similarities drew other artists such as Johnston. Born in 1888 in Toronto we take up Johnston’s life as a teenager. He was sent to Germany at age 16 where he studied art abroad for about three years. Increasing his art abilities, he, like many of the remaining artists in this cadre, returned to Toronto after this schooling and found himself employed at Grip Limited as a commercial artist. While there he became acquainted with members MacDonald, Thomson, Lismer, and later Carmichael who became employed with this company where we find the nucleus and original members of the Group of Seven. Meantime another very large group of men in Toronto had formed the Arts Letters Club which was a place designed for a broader spectrum of the arts. Johnston met Harris another Group of Seven artist within this group where conversations abounded around literature, architecture, acting, painting, music, and sculpture. With such a large variety of creative interests, this club grew to about one hundred members. When he was only 22 years old, Johnston decided to further his studies of art in the United States and thus attended the Pennsylvania Academy of Fine Arts. He obtained work in the United States to help support his schooling and expenses. He was offered many jobs in commercial design which he completed successfully, but his heart was in landscape painting. He returned to Toronto and exhibited with the Group of Seven’s first exhibition in 1920, then went on to become principal at the Winnipeg School of Art, but he maintained his friendship with members of the Group of Seven. Johnston’s work evolved into stronger realism while others in the Group of Seven shifted into more abstract. Johnston became intrigued with the effects he could create with the impact of light on his work—especially the effect on snow. He took many trips with the Group of Seven as they explored territories north of Lake Superior. Johnston’s work was also differentiated by his use of tempera and he grew quite proficient in this medium. Johnston changed his first name to Franz in 1927 and became one of the most prolific artists of his time. He remained friends with The Group of Seven, but due to the quantity and quality of his work, he separated and exhibited in shows where his was the only work. He was made a member of the Royal Canadian Academy of Arts before he passed away in Toronto in 1949. Andy Corp and Brenda Stichter, two local favorites, are on view at Lakeland Art Gallery this month. Lakeland is open 11:30 a.m. to 4:30 p.m. Wednesday through Saturday. Located at 302 E. Winona Avenue in Warsaw. Please go view the work of these two very talented artists. There is never a charge for LAA exhibits. Coming Sept. 1 at Mount Memorial on Grace College Campus “Iris” exhibit. Open through Oct. 7. Coming Sept. 6 at Lakeland Art Association, Exhibit by Paul Raimen and James Miller. Miss some columns? Email [email protected] Questions about art or topics in the columns? Call (574) 527-4044.